Thomas Lanier William III, also known as Tennessee Williams, is considered one of the three most prominent American playwrights of the 20th century, along with Eugene O’Neill and Arthur Miller. From his upbringing in Mississippi, to the height of his career in New York City, Williams wrote some of Broadway’s most famous productions. He became famous at the age of 33 with the production of The Glass Menagerie, and experienced several decades of fame until his eventual downfall in the late 1900s. Williams remains to this day a historic figure in the history of theater. 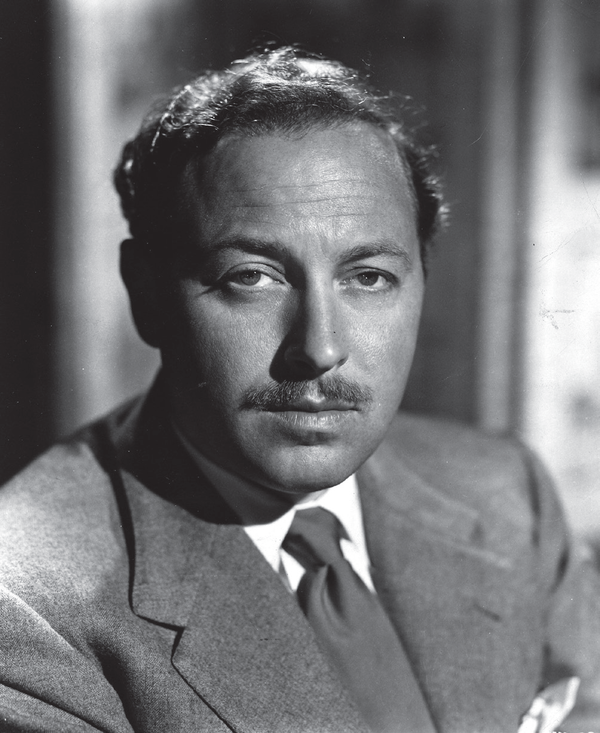 Tennessee Williams was born on March 26, 1911 in Columbus, Mississippi. As a child, Williams developed a severe case of diphtheria, confining him to his home for nearly a year while he healed. As a result of the illness, Williams was less fit to play as other boys his age. When he was old enough to attend college, Williams decided on the University of Missouri in Columbia. He studied journalism here from 1929 to 1931, but quickly became bored of his studies. He began entering essay, short story, and play contests, hoping to earn extra income. Beauty is the Word made Williams the first freshman to win an honorable mention award in one of the university’s writing contests. After failing a military training course his junior year, Williams’ father pulled him from school and sent him to work at the International Shoe Company factory. Williams spent his evenings and weekends writing, vowing to write at least one short story every week. But after months of being overworked and stressed, Williams suffered a nervous breakdown at the age of 24. He quit his job, and in 1936 enrolled in Washington University in St. Louis, then went on to the University of Iowa where he earned a Bachelor of Arts in English in 1938. Williams studied at the Dramatic Workshop at The New School in New York City, where he received intense training in theater. In 1939, he officially adopted his professional name of Tennessee Williams. Williams’ first glimpse of fame arrived in 1944 when The Glass Menagerie appeared on stage in Chicago and received a set of starred reviews. It moved to New York City and was a hit. Here, it won an award for the best play of the season from the New York Drama Critic’s Circle. In 1947, Williams’ reputation was secured with the production of A Streetcar Named Desire. During the 1940s and 1950s, Williams traveled most of the year with his partner Frank Merlo. He moved from New York, to New Orleans, to London, to Rome and more. The years between 1948 and 1959 were ones of great success for Williams. He had seven plays produced on Broadway. Among them were Summer and Smoke, The Rose Tattoo, Camino Real, and Cat on a Hot Tin Roof. By the end of 1959, Williams had earned two Pulitzer Prizes, three Donaldson Awards, and a Tony Award. In the early 1950s, A Streetcar Named Desire and The Glass Menagerie were made into feature films. The 1960s and 1970s brought a set of new challenges for Williams. He continued to write, but his work was underscored by an unmanageable addiction to alcohol and drugs. To make matters worse, his partner died in 1963. Williams was enveloped by depression after Merlo’s death. He spent time in and out of mental health treatment facilities. He grew increasingly dependent on prescription drugs, and was never able to recover his style of writing from his earlier years. The next seven plays were flops at the box office. Williams became more of a recluse and depressed as the years wore on. While in his 60s, he had a relationship with a young aspiring writer in his 20s named Robert Carroll. Carroll had also experienced problems with drug abuse in the past, and friends of the two called the relationship “toxic.” The two men broke up in 1979, but Carroll remained one of the two people in Williams’ will. On February 25, 1983, Williams was found dead in his hotel in New York City at the age of 71. According to the autopsy report, he died from choking on a plastic cap bottle. Today, the Harry Ransom Center at the University of Texas in Austin holds the oldest and largest display of the works of Tennessee Williams, along with 250 person items recovered from the writer’s home. Williams is widely regarded as having played a transformative role in theater. His stories are some of the most well-known to have ever met the stage, and serve as the legacy Williams left behind.